For years the market environment has been too intoxicating for many investors to remain disciplined. However, the return of volatility in 2018 serves as a wake up call, especially for those nearing retirement. The problem with not having a well-diversified portfolio is that with only a limited amount of time to save for retirement, not every investor can wait for the “average” return of equities to make them whole after a market downturn. And many fail to realize that it’s not only about the loss of monetary resources, but also the loss of time in which to make them back. 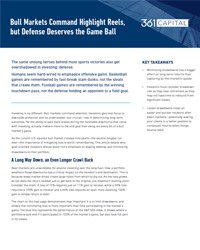 Those nearing retirement may not have time to rebound from significant losses. Visit the Alts Resource Center to learn more about Alternatives. The annual returns of 3%, 7% and 11% are hypothetical and used to demonstrate how long it may take to recover losses over time. The returns do not represent or predict the performance of any fund. Think it can’t happen? Think again. Millions of people were headed for retirement with heavy equity concentrations in 2008 when the Dow began its precipitous fall, losing about 54 percent when all was said and done some 16 months later.1 With market indices still hovering around all-time highs, pre-retirees are tempted to play roulette with their retirement assets. Investors nearing retirement face a challenge: how to generate real returns sufficient to meet their needs in retirement, while also protecting their savings against potential bear markets and black swans. Using alternatives in a portfolio may add a level of diversification by offering access to strategies with little or no correlation to traditional markets and help mitigate downside risk by utilizing trading strategies that attempt to counteract large market movements. Alternatives have historically delivered more stability to investors over various market cycles. Source: Morningstar. Data from 1/1/1994-12/31/2018. Stocks are represented by the S&P 500 Index, Bonds by the Barclays Aggregate Bond Index and Alternatives by the Credit Suisse Hedge Fund Index. It is not possible to invest directly in an index. Since 1994, alternatives have outperformed at least one element of an investor’s core* portfolio 76% of the time. With little-to-no correlation to traditional markets, certain alternatives can offer investors “true” diversification, while other alternatives may offer downside protection without sacrificing return potential. *Investor’s core is represented by stocks and bonds. Stocks are represented by the S&P 500 Index. Bonds by the Barclays Aggregate Bond Index and Alternatives by the Credit Suisse Hedge Fund Index. It is not possible to invest directly in an index. Alternative investing is subject to increased risks including the possible loss of your total investment. 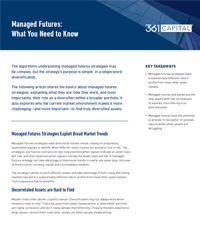 Such strategies have the potential for heightened volatility and may not be suitable for all investors. 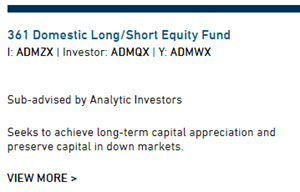 Investing in a long/short strategy, presents the opportunity for losses which exceed the principal amount invested. 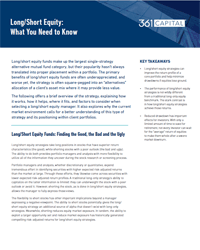 Diversification and asset allocation may not protect against market risk or loss of principal. Morningstar Overall Rating™ derived from a weighted average of the fund’s three-, five- and 10-year risk-adjusted returns as of 12/31/2018. 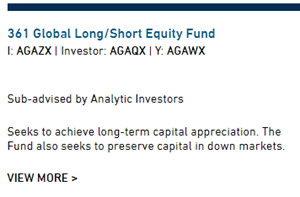 The 361 Global Long/Short Equity Fund Class I shares was rated 3 stars Overall and for the 3-year period among 199 funds in the Long/Short Equity Fund category as of December 31, 2018. 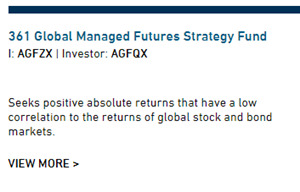 The 361 Global Managed Futures Strategy Fund Class I shares was rated 5 stars Overall and for the 3-year period among 95 funds in the Managed Futures Fund category as of December 31, 2018. 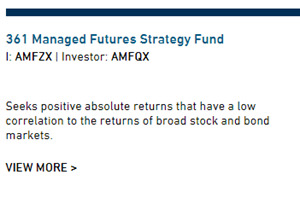 The 361 Managed Futures Strategy Fund Class I shares was rated 4 stars Overall, for the 3-year period among 95 funds, and for the 5-year period among 65 funds in the Managed Futures funds category as of December 31, 2018.